Fusion with elements of rock and jazz, over tones of the blues, and a touch of "strangeness". It's a Strange Thing — Perry takes it to the next level and showcases the depth of his performance catalog. Perry Joslin's long awaited second CD highlights the energy and excitement of the Perry Joslin Project. He has assembled a top-flight team, with two surprise additions, that love to play this unique combination of jazz fusion. In addition to the well established musicians on the first CD, two highly esteemed artists join the fray. Andy Narell, master of the steel drum, appears on the track "There's Something About Perry". World renown saxophonist, Warren Hill, joins Perry's band in their jazz rendition of Led Zeppelin's "Kashmir". I am listening to PJT in my car with a 300-watt 12" sub. It sounds like I'm listening to this live. Every instrument is crystal clear and the bass lines are more felt than heard; as it should be. I'm less into this kind of fusion these days; more into guitar-driven fusion and instrumental guitar blues (i.e., Ronnie Earl). However, Perry Joslin's acoustic piano sounds fantastic. Of course, the man is quite skilled. The music is melodic and a joy to listen to. The sax solos are meaningful and not meandering. PJT's rendition of "Kashmir" is extremely well done as stands on it's own. The treatment of this classic suggests that PJT could do a CD of covers and it would be loads of fun. 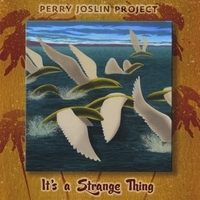 "It's a Strange Thing" is eight years old and appears to be the last studio effort from PJT. Too bad. It's excellent!